So I've been part of the quest of making all Facebook social plugins faster, even if it means rewriting them from scratch. After the Send plugin, Like button (perf optimizations described here), Follow plugin, Facepile and Likebox (perf details here), now you have a faster Recommendations plugin. The techniques used to make it faster are simple and effective: better resource packaging, reducing number of requests, inlining CSS, reducing the amount of CSS and JS by untangling dependencies, cleaning up, and sometimes simply rewriting. You can read more about these in the previous posts. Now the results. The before-after comparison is accurate because it uses snapshots taken at the same time. This is possible because we kept an old endpoint serving the old code path. The official URL is /plugins/recommendations.php but we kept the legacy URL /widgets/recommendations.php pointing to the old code for a little while. The total payload change is drastic. Mainly due to better packaging. And better JS modules and dependencies. The fully loaded time is not all that important since the user has a usable list of recommendations already delivered with the initial paint. But it's still 2x faster which makes me happy. 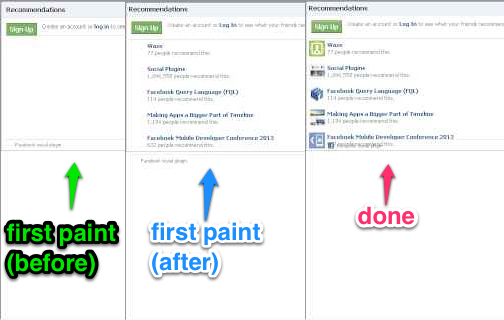 2x faster plugin overall, 2x faster (and infinitely better) first impression. 7x payload improvement. Just want to take a second to mention how good it feels to be working on such high-impact performance optimizations. These social plugins are everywhere on the web. By making them faster I am fortunate to have the opportunity to make the whole web faster. Meaning make millions of sites faster, affecting the live of billions of people, every day. What can I say, Facebook is a great place to work. The people, the impact. Every line you write matters. It's also up to you to pick what do you want to work on and where your talents and interests will have the greatest impact. And then there are the hackathons and hackamonths which means even more freedom. I recently finished a hackamonth project, which explains why I've been silent here and on Twitter and everywhere (yet, thanks to O'Reilly folks, even though I missed a few deadlines, we were able to push this baby out the door). Let me tell you - a hack-a-month is better than vacation. Being left alone for a month to explore a completely new (to you) territory - priceless!